Below, are Powerpoint presentations, "fly on the wall" video presentations and the Irish "Anti-Bullying Procedures for Primary and Post Primary Schools" (as well as draft school anti-bullying policies and other useful resources). 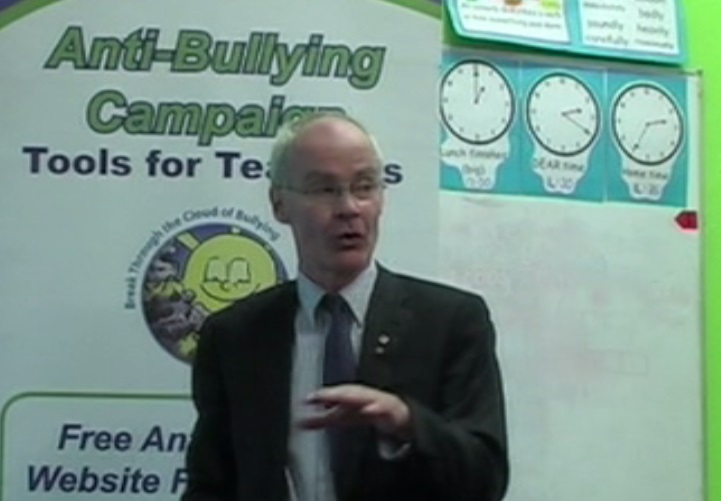 Explaining the Anti-Bullying Campaign - for Teachers in Primary (Elementary) Schools. Explaining how the Anti-Bullying Campaign programme can be implemented in Primary (Elementary) Schools. This video is in three distinct sections that can be shown separately to staff on successive occasions. The first, lasting 33 mins, explains the nature and impact of bullying, the second, lasting 35 mins, explains with examples, the range of awareness raising exercises we offer and the third, lasting 33 mins, explains how to implement the "reform, not blame" approach that is so effective in resolving bullying situations. Sincere thanks to Mike Moriarty who filmed this talk on a voluntary basis. 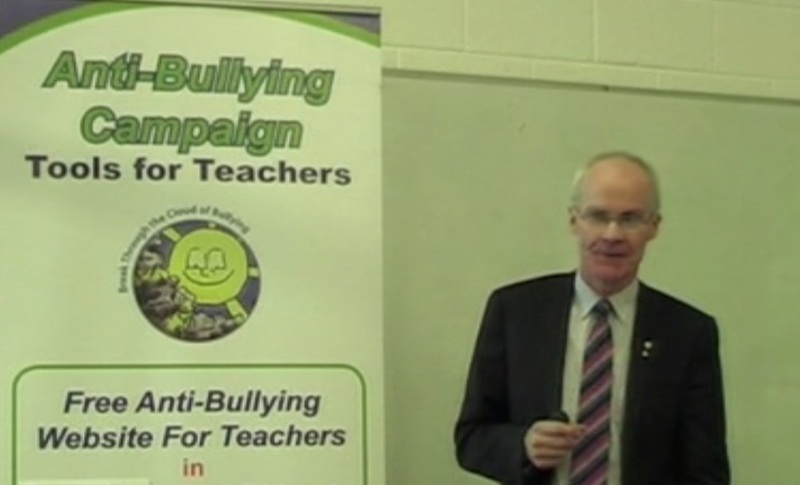 Explaining the Anti-Bullying Campaign - for teachers in Post-Primary (High) Schools. Explaining how the Anti-Bullying Campaign programme can implemented in Post-Primary (High) Schools. This video is in three distinct sections that can be shown separately to staff on successive occasions. The first, lasting 35 mins, explains the nature and impact of bullying, the second, lasting 38 mins, explains with examples, the range of awareness raising exercises we offer, free of charge and the third, lasting 39 mins, explains how to implement the "reform, not blame" approach that is so effective in resolving bullying situations. Sincere thanks to Mike Moriarty who filmed this talk on a voluntary basis. 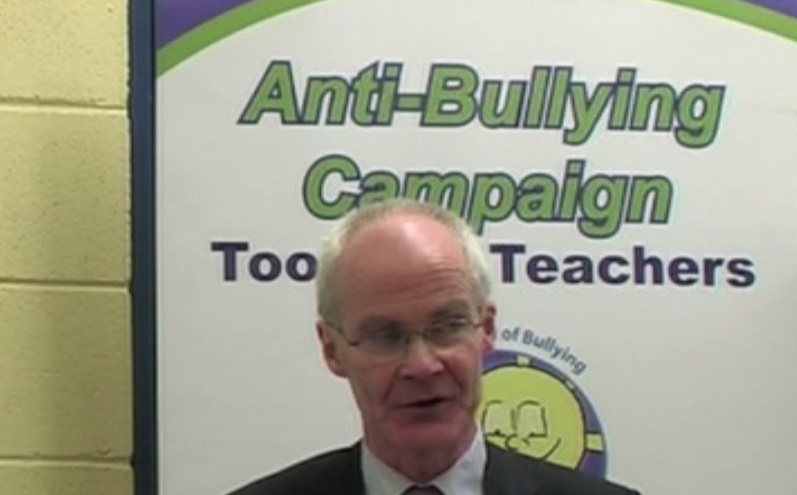 Explaining the Anti-Bullying Campaign - for parents of children in Primary (Elementary) or Post-Primary (High) Schools. Explaining to parents how the Anti-Bullying Campaign programme works in schools. This video is in three sections. 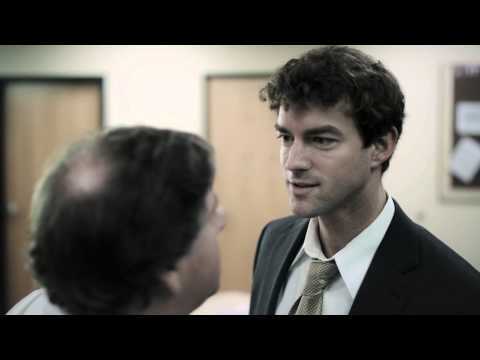 The first explains the nature and impact of bullying, the second explains the Anti-Bullying Campaign approach to bullying that is so effective in schools and the third gives parents information on cyber-bullying. While this video was filmed in an all-boys school the tools and methods of the Anti-Bullying Campaign that apply here apply equally well in all-girls schools and in mixed schools. Sincere thanks to Mike Moriarty who filmed this talk on a voluntary basis. This is the Anti-Bullying Procedures document providing a framework within which Irish schools must implement their anti-bullying policies. Anti-Bullying Draft Policy for Primary Schools to adapt for their purposes.